Have you been looking for Restaurant Jobs in Dubai? If yes then you have visited the right place because you will find the best opportunities for Restaurant jobs here. It is an up to date website that provides you restaurant jobs for across UAE not only for management level but also for labor. Whether you have been taken for permanent job in restaurant are you want to get a full time job in any well-reputed restaurant in Dubai, you will find the best opportunity is here. The most recent job opportunities are announced here that offer attractive packages so as to keep individuals aware of what they are looking for. Dubai is not only considered as the land of opportunities but also it is considered as the place for tourism. People from different parts of the world go there on visit visas just for entertainment. 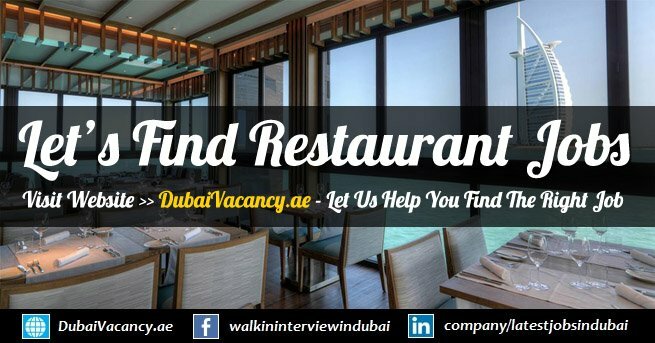 There are a big number of restaurants in Dubai for such people and hence, there are many opportunities for those who have been looking for restaurant jobs.